While Samsung is all about the Galaxy S10 lineup right now, as the device is projected to be announced in just a couple of weeks, the South Korean manufacturer is also working on several other devices, including a successor to the Gear Sport. As a smartwatch particularly focused on fitness tracking, the Gear Sport could be refreshed this year with a model called Galaxy Sport. Samsung has changed its naming approach for smartwatches beginning with the Galaxy Watch, and as part of its intention to use the Galaxy brand for wearables, the upcoming device could be called Galaxy Sport. 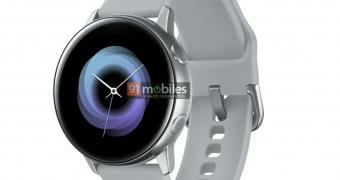 A render published by 91mobiles shows that this new model would continue to feature a classic watch appearance, though it’s hard to tell from this picture if Samsung still wants to use its signature rotating bezel or not.